Okay, I'm on the outside now, but I was on the inside for a couple of years... following on from the DC discussion. I believe that District Leader meetings are critical to the development of a District, just as Group meetings are for the wellbeing of a Group. These meetings create a forum for an exchange of views, experiences and sharing of concerns. Without them, Leaders become inward looking and isolated. It is important that any such meeting is enjoyable and that people leave the meeting feeling that they have gained something positive. The best were those where the meeting was run like a Troop meeting, with Leaders in mixed groups so that there was a cross section of scouting in each group, where the BSL got to understand the SL and vice versa. Where ideas across groups were shared. Sectional meetings could be included as part of the evening, but they should not be the main part of the meeting. The best Leader meetings had SHORT notices, an introduction to interactive games, a presentation on an activity, something that everyone took away something that benefited them and their section. The worst, were when the DC stood and read out from the District newsletter, in full and verbatim. Then we discussed the content, and then we went home. Crap. And I said so at the time. The former were great, busy events that drew people in. Sadly, when the DC changed, we ended up with an instant transition to the second format. It absolutely killed the Leaders' meetings stone dead. It is also critical that these leader meetings must sidestep the power politics and the bullying tactics used by some. People have to come together because they want to be there and they want to grow and learn. Otherwise, they become pointless exercises in a waste of everyone's time and the sap morale out of people. So, my ideal Leader Meeting for District. Initially, this may have to be stage managed by a single individua, but if it works it could take a life of its own. This was a key element of where I wanted to take District, but I was over-ruled at every turn. I entirely agree with you bushfella. When our current DC took over he introduced all Leaders meetings rather than sectional ones. So each term we have the opportunity for all Leaders in the District to come together exchange ideas and information and get to know each other a little better. The format is everyone together to start with where any information/activities relevant to everyone and any award presentations can be done then refreshments followed by breaking into Section meetings before coming together for drinks afterwards in the bar for those that want to. Ok I do think the first bit can drag on a bit too long sometimes but other times we have had good interesting sessions such as giving feedback on the new strategy before it was finalised and launched, presentations on county camp, information from the Regional Development Team, and last one we did a really interesting idea exchange thing which was based on speed dating where you each pair gave answers to a question by discussing it and then moved on to make a new pair and answered a different question. Questions ranged from what improvements would you like to see at the District campsite to what ways are there to enable youth shaped Scouting and everything to what activities would you like to see at a District camp. We don't have District Leaders Meetings any more. It seems to be something that has withered away over the last few years and now doesn't exist at all. I don't think we ever had them, I recall there being an attempt, but I think it defaulted directly to a workplace away day format. We had two HALO weekends which were great. If I'm being honest, I don't think it's necessary to have any sort of formal sessions, you can get all that on tap from the internet. As Pete said, the most useful part was the bun fight/drinks at the end. I will move heaven and earth, go light years and aeons out of my way to avoid a workplace away day, so I wouldn't be keen on a structured leader's meeting. I'd definitely go to a social though, at the end of the day, the main thing everyone has in common is Scouts, so it stands to reason, that'll be what you chat about. The point though is that the "structured" meeting is social. It creates opportunities for cross pollination of ideas and networking within the association, and hey, guest speakers can drop in and suddenly your networking takes on a wider perspective. From observation - a lot of long serving adults avoided attending any District meetings, they often knew it all, had it all sewn up, didn't actually want their apple cart upsetting with new ideas. They actively disuaded new leaders from attending. The very people who could help others wouldn't and the ones who needed help were put off by those who didn't see the point. Bad Leader Meetings are bad for Scouting, Good Leader meetings help build and grow and we should be enthusiastic and positive about them and encourage them - I would. I'm lucky, as DESC I get to go to District Exec meetings, and GSL/ADC meetings! Oh, and County DESC meetings. The latter exist just for me to plug Theme Park Camp right? what's theme park camp, please tell me more.. perhaps with a url? Structured meetings have a way of putting folk off though - because they're 'structured'. No offence, but I wouldn't go to the meeting you described in your first post up there, it's just not my cup of tea. But that's not to say it wouldn't be anyone elses. It's a weekend camp for Explorers & Network held every September, next one is 13-15th September 2019. It's a laugh. The thing is though, that if you did attend you may learn somethinguseful, you may be able to give the benefit of your experience to others. I know of a couple of long serving Scouters who went out of their way not to work with anyone else, not to share ideas, not to be part of the wider Scouting community. They would have been just as well being independent with no connections at all. Yet they had vast experience that could have benefitted newcomers. Instead, the naysayers had their way. The old guard killed any incentive to grow and change and try new ideas. It wasn't Scouting, don't you know. Without the benefit of joint meetings I use Escouts, still, though not so much as I used to. I am member of a couple of Scouting groups on FB - but not 1st FB, and I recently withdrew from WF because, I didnt share their enthusiasm for the one party state and was told as much. I gain "support" from the groups that I am a member of. It wasn't Scouting, don't you know. But I'm not saying networking, getting together, sharing ideas etc is wrong. I'm just saying - personally - I used to be a lot more invested all those things, I used to go to meetings and training etc - but they were bo-o-o-ring. 90% of what they were saying was already out there if you cared to look for it - and in a form that didn't involved sitting in an overly warm room listening to some boring old fart (shoosh now - #selfawareness ) more interested in the sound of their own voice than of making anything they said in the least bit interesting. 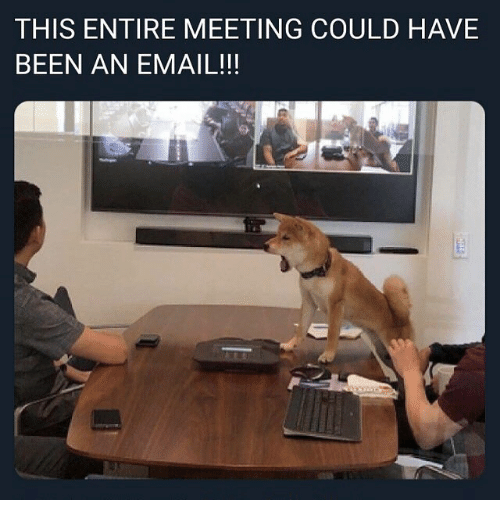 And I maintain, in all my years, I've gotten infinitely more out of offline impromptu chats than I've ever gotten out of structured meetings. That said, I'm not a joiner. Scouts is the only thing I ever joined, and even then that's arguable because technically I joined when I was about three - I didn't have a choice. I prefer to sit quietly and read, either here or anywhere else there's something useful to ingest. I don't like meetings, I don't like them at work either. I find them to be a waste of time, only a fraction of the time is ever spent covering topics you might find useful - you can't control it or dip in and out like you can in social circumstances, you just have to sit with what you hope is a mildly interested look plastered to your face until something you do find interesting comes up. Come on down... I'll lay odds nowt has changed. I patently feel (felt) strongly about the lack of networking and the cliques that restricted development. I quite like meetings which is a good job seeing as I seem to attend an large number of them both in Scouting (Groups Scouters every half term, Group Exec, District Leaders Meetings every term) and in another organisation I volunteer in (one Exec meeting a month). So that is a minimum of 24 meetings each year and usually we have a camp planning meeting or two in there as well. The one thing that does frustrate me is discussing the same issue time and again because no one actually followed up their action points from the previous meeting. Its noticeable that since the other non scouting organization I volunteer with has had a new chair that all of a sudden things have started happening and we are actually making decisions and getting things done by the next meeting rather than prevaricating and putting off decisions which seemed to be the order of the day previously so long as the meetings were completed within an hour.